This is an absorbing read for kids who are fascinated by space and like mysteries. I was hooked on it and didn’t want to put it down. I discovered this book through the list of “new books” at my local library and put in a hold request. It was worth the wait! 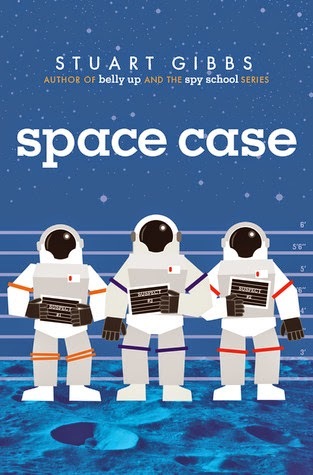 Space Case (Moon Base Alpha) by Stuart Gibbs, Simon and Schuster Books for Young Readers, New York, 2014. Dash is a character that would be fun to hang out with because of his realistic observations about the moon base, his persistence in wanting to solve the mystery and, most of all, his likable personality. This book was intriguing and funny at the same time. I especially liked the excerpts from a fictitious manual called “The Official Residents’ Guide to Moon Base Alpha” at the beginning of each chapter. As a writer, I want to read this book again. There’s a lot to learn from here about the execution of an intriguing concept. The voice of the main character draws you into the story world and the mystery. Details unfold at just the right time to keep you wanting to read more. Stuart Gibbs lives in Los Angeles, where he also writes for TV and movies. Space Case is the first in a series, so we can expect more space adventures with Dash. Stuart Gibbs writes two other series, the FunJungle series and the Spy School series. Can't wait to read all of those! I read Belly Up a few years ago and really enjoyed that one too. For more, visit Stuart Gibbs’ website. This sounds like a really fun book, especially since boys would like it. And I loved the first lines. I loved this one, too. So many great scenes and the ending sure did leave it open for another adventure in space. I really need to read this one! My 12-year-old son loved it, and he's not usually one to get captured by fiction. Its definitely got kid--appeal! This sounds great--and I am currently reading "The Martian" by Andy Weir (I know, adult fiction! Shocking!.) This might be a good mg companion for afterwards. This sounds great. I do love a mystery, but never would have picked up a space book. Thanks for the review.